Volunteers from Swindon Borough Council, Nationwide Building Society, Great Western Hospital and residents of North Swindon have joined together to donate over 200 hampers to those who will be alone this Christmas. Swindon Borough Council’s ‘Give a gift at Christmas’ scheme will see presents delivered to over 200 people in the Borough who will be spending Christmas Day alone and are unlikely to receive a present this year. These individuals have been identified through Social Services, the Community Navigators project and Swindon Circles, a voluntary befriending service run by the Council. The generosity of Swindon residents also meant that gifts were distributed via the voluntary and community sector, including through Citizens Advice, Headway, Swindon Mind, Phoenix Enterprises, and other organisations. The impact of the gift giving project has been phenomenal so far, with many tears of joy being shed by those receiving the gifts. The distribution of the presents has begun and the team are committed to delivering them all by Monday (25 December). Alongside this gift campaign, the Council’s Community Health and Wellbeing Team also organised a festive get together for those who are not housebound, but still face being alone on Christmas Day. 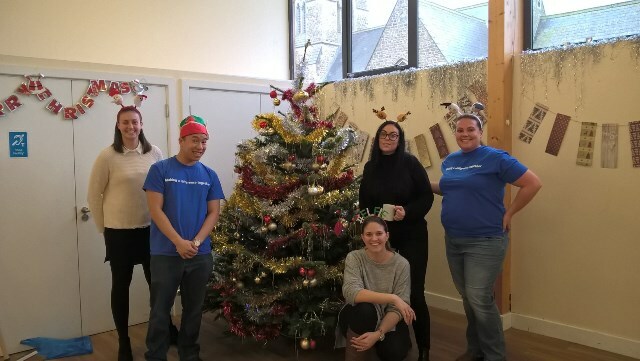 ‘Yule Meet Again’ was run in partnership with Zurich Community Trust and offered an afternoon of festive fun and food with other local people. The event also attracted a number of local donations, including a real Christmas tree from Cllr Nick Martin, which is now at homeless charity Threshold Housing, as well as decorations from Wyevale Garden Centre and Zurich Community Trust. The tree can be seen at Threshold's interactive photography exhibition which is open free to the public daily until New Year’s Eve, at 5 The Plaza Brunel Shopping Centre. Many other generous donations were made including presents, cards, as well as cakes from Forget Me Not Bakers. Michael Keenan, Business Manager at Threshold, said: “It’s fantastic to be a co-contributor with numerous Swindon Borough Council projects. It has been so wonderful that so many people have contributed so much to improving the lives of others right here in our local community. These donations make such a real difference to so many local people, not just at this Christmas, but all year round”. Anyone who would like more information about volunteering with Swindon Circles, which looks to match local volunteers to those who are socially isolated and in need of a friendship, can contact the Live Well team on 01793 465513 or livewell@swindon.gov.uk .